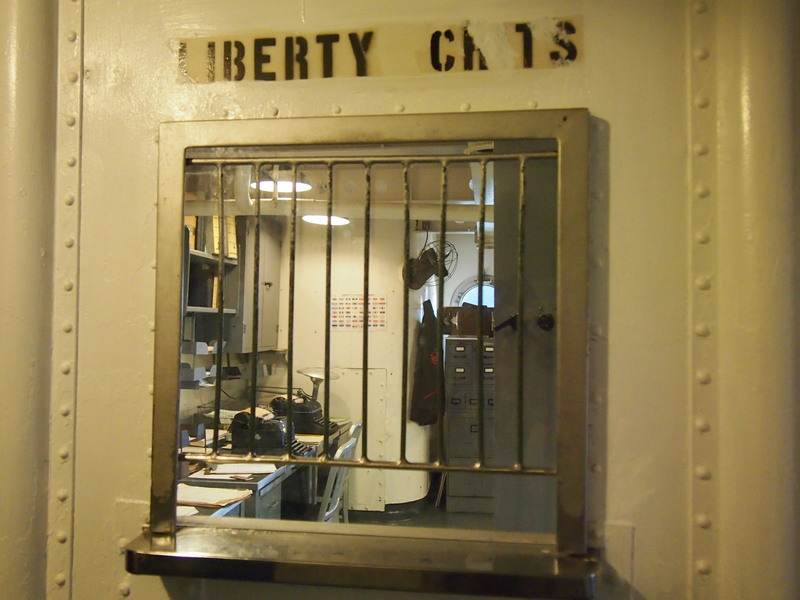 On the afternoon of December 1, 1942, about three dozen sailors left the USS Gherardi for a few hours on liberty. The ship was moored to a pier at the Torpedo Station Annex, Coddington Cove. This is located about four miles north of the Government Landing, Newport, Rhode Island in Narragansett Bay. The sailors left the Gherardi in two motor whaleboats. Lester’s buddy Harry Haring was on duty as engineer in one boat. Off duty and taking advantage of his shore leave, Lester rode to shore in Haring’s boat. He welcomed the chance to stretch his legs on the streets of Newport and planned to shop for stationery and envelopes. Perhaps he also hoped to find a few gifts to send his family for Christmas. The sailors were to report back to the pier for a return to the ship by midnight. Sometime during the evening hours, a storm brewed at sea, moving into the bay. By midnight the waves churned wildly off the pier. Raymond Johnson, age 18, the coxswain of the second boat, conferred with Haring for a few minutes. Concerned about the inexperienced fireman on his boat, the coxswain requested assistance. Haring, confident that his friend Lester had mastered the skills needed to operate the diesel motor through any weather, asked Lester if he would lend a hand. Haring knew his friend well. Lester, a cheerful, easy-going and competent fireman, agreed to help. The whaleboat carrying seventeen sailors, including Johnson as coxswain and Lester, as engineer, launched at 12:05 a.m. the morning of December 2. The sailors hunkered down against the driving wind as the boat headed into the bay, toward the Gherardi. Haring’s boat left ten minutes later. 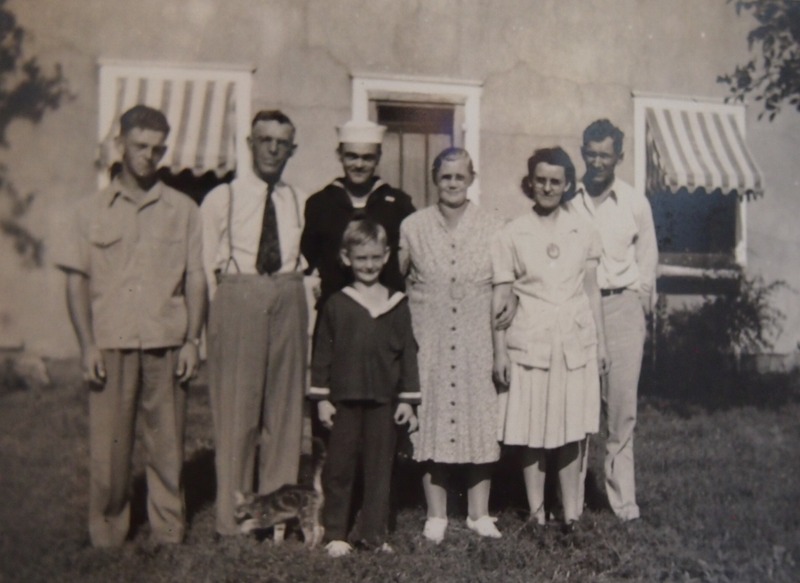 After an hour’s grueling trip, an easy forty minutes in fair weather, they arrived at the Gherardi to learn the first boat was still at sea. 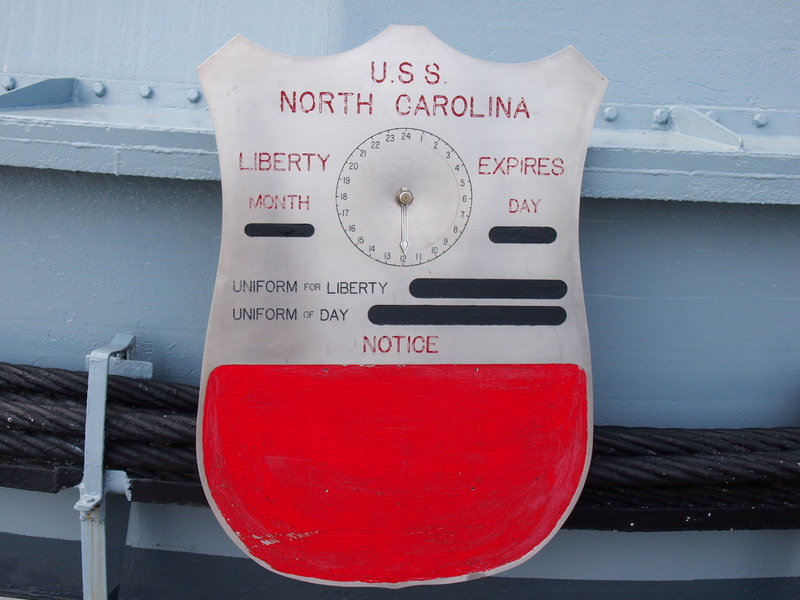 The officer of the deck was informed and search lights were played on the water in the hopes that the men would see the lights in case they had blown off their course. After a half hour of no success, the naval and civilian authorities were informed about the missing boat. Eventually, the crew of the destroyer had to abandon efforts to locate the missing sailors when the storm intensified. In the early hours of December 2 it even threatened the safety of the Gherardi herself. After a steel mooring cable parted, the unusual procedure of securing the USS Gherardi to the dock with the anchor chain was initiated. The following morning, the wreckage of the whale boat was found washed ashore. Two bedraggled sailors clung to the boat. Fifteen others were missing. Lester was among the missing. 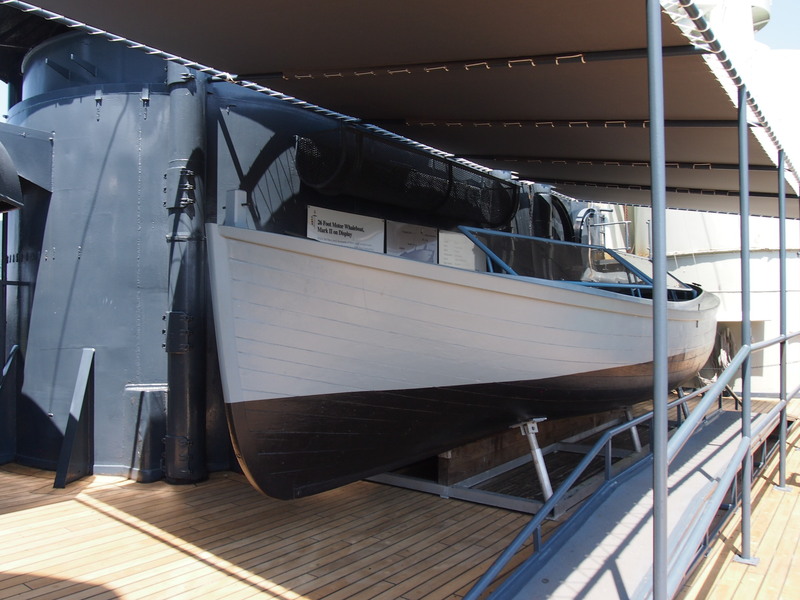 Though details of the whaleboat’s fate remain unclear, some believed that the whaleboat collided with an object in the water, a rock or a buoy. “The collision likely stove in the bow and stopped the motor,” Joseph Feingold wrote to his friend’s family. Lester must have worked madly to restore power to the diesel engine, but a large wave swamped the boat, followed by another which capsized it. 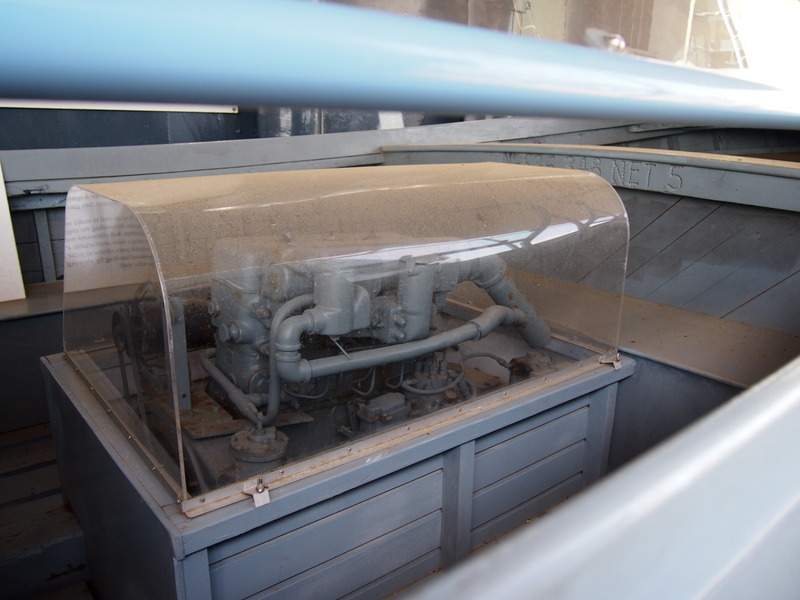 The diesel engine (under showcase for display) which powered the motor whaleboat. The two sailors who survived the storm were identified as strong swimmers. 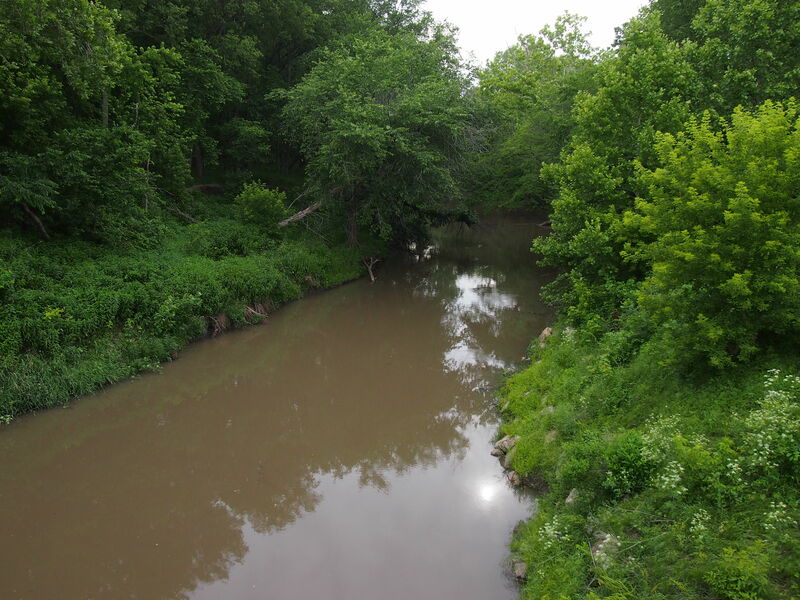 Lester surely could swim, as he spent many summer hours in the river which ran through his family’s Kansas farm. But he was not lucky enough to cling to the boat, and he was hardly prepared for a dip in the December waters of an angry ocean. And then at the very end, perhaps his thoughts drifted with a heavy longing to Josephine, his beloved fiancé. What would she do now?